Erin S. Lane is one of my favorite people, even though we shouldn’t really be friends. She’s a 5 on the Enneagram, and she has explicitly told me she normally hates 3’s. We really just had a conversation and pressed record, but we talked quite a bit about the book proposals we’ve both recently worked on, especially about how angsty that process is (but come to think of it, she didn’t describe her process as angsty at all – that was mostly me. Or maybe all me, I can’t really remember). Oh, and I actually beeped out the mother of all swears on this episode. Happens at about minute 36. I’ll let you guess who let that one fly. Follow Erin on Instagram, Twitter, and Facebook. CLICK TO LISTEN AND SUBSCRIBE! Check out Erin’s books (unless you can’t have nice things). Belonging to the church has become a lost art, especially among my millennial generation. But it’s not simply that we’ve chosen not to belong. It’s that we’ve forgotten how. Lessons in Belonging (InterVarsity Press, 2015) is a story about remembering how to belong to God’s people – and often failing. It’s about my search for a church home as a Catholic feminist in the American south. It’s about becoming a pastor’s wife before I became myself. It’s about trying to make friends when friends are making babies. So, too, is it a story about enduring community when it’s awkward, and small talk suffocates and the preacher gives bad sermons and the suffering of strangers feels intrusive. Still, we offer our pained lives to one another like bread and say, “Take. Eat. I belong to you.” Click here to purchase on Amazon. What happens when young, American women speak the unspeakable about our experiences of faith? This anthology of 40 essays from women under 40 unearths the taboos that have stifled us, divided us, and prevented us from feeling at home in our Christian communities. 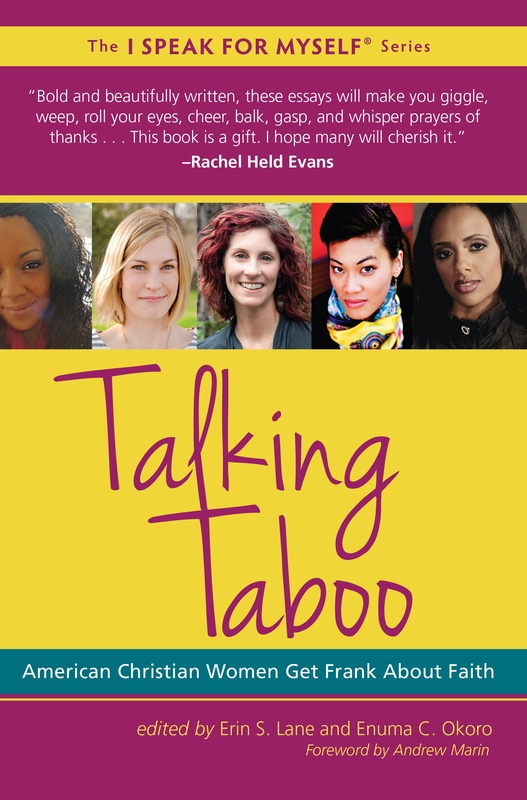 Perhaps the coolest part of Talking Taboo (White Cloud Press, 2013) – this whole series, really – is that you get to hear women speak for themselves. This takes the pressure off having to agree with them or even “tolerate” them, and instead, you get to bear witness to the people who are living in your neighborhoods, communities, churches, and home. So, pour a cup of tea. Pull up a chair. Get to know us. Maybe you’ll get to know something of God a little better, too, in the process. Click here to purchase on Amazon. It was 1989, and I was sitting in a Developmental Psychology class in the fall semester of my freshman year of college. I was nineteen years old. And our middle aged, bald, male professor told us he was a feminist. I had no container in which to hold that one. I pushed back. I didn’t like the word feminist when I was nineteen, and I really didn’t like it that a man said he was one. I have a female friend who happens to be a pastor. She was going through some personality testing while she was studying to be a pastor, and when the (male) facilitator sat down to debrief the results with her, he was visibly uncomfortable. Your results, he awkwardly mumbled, show traits I usually see only in men. Assertive, dominant, competitive, self assured. “But I’m clearly a woman,” she smiled. She’s quite sure of herself, in a very positive, grounded, secure, awesome kind of way. “Yes, well, yes. Clearly,” the facilitator said, not quite able to meet her gaze. I have a male friend – also a pastor (I need to get out more) – who is nurturing and physically affectionate. When he meets older women at church, it’s very common for him to kiss them on the cheek – and it’s completely comfortable and natural when he does it (seriously). He cooks and shops for his family. He belts out lyrics to musicals as loudly and as often as he can – in his car, in public, anywhere. When you’re with him, you feel loved in remarkable and very intimate ways. He is one of the most loving people in my life. He makes me smile, every time I’m with him. One of the most revolutionary verses in the bible occurs in its first chapter. “So God created humankind in his image, in the image of God he created them; male and female he created them” (Genesis 1:27 NRSV). Everything that is good about masculinity comes from God. Everything that is good about femininity comes from God. Now here’s what’s revolutionary: God is both masculine and feminine, and we – all of us – are created in that image. God is not gendered. But God is also not genderless. God is genderfull. And we are created in God’s genderfull image. Men are created in God’s genderfull image, and women are created in God’s genderfull image. Which means that some of us men have strongly feminine characteristics, and that’s a good thing. And some of you women are going to have strongly masculine characteristics, and that’s a good thing. We all have a mixture of both masculine and feminine characteristics, and that is a very good thing. Can you be fully you, or are you being hindered by the familiar tropes of what men and women “should” be, especially in the church? (Men, your job is to lead and be assertive! Women, your job is to take care of things behind the scenes, serving meals but certainly never serving communion). I realize those might be outdated examples for some, but I’d argue that we have a ways to go in expressing and experiencing the full range of who we are – men and women – with each other. Genderfull is happening on Saturday, November 12th, at Awaken Community (a church in St. Paul, MN), from 9am – 4pm. We really hope you can join us. For more information, including all the details and a link to register, please click here. In this episode, Erin Lane and I had a rambunctious conversation about the image of God – the expansive, mysterious God who is fully masculine, and fully feminine. Erin is fascinating and brilliant and funny, and I had a blast. I asked her a slew of questions, and she asked me a bunch, and the result was a very long conversation that I hope will encourage and inspire you. I hope it feels like you were sitting on the couch next to us. Oh, and please check out the links below. Erin is an unbelievably gifted writer and thinker. You’re going to want to order her book NOW. Erin mentioned this book: The Kindness of God: Metaphor, Gender, and Religious Language, by Janet Martin Soskice. Erin also talked about a continuum she uses to make decisions; how she has learned to say no to certain things and yes to other things. I found it really, really helpful. You can read about it here. Erin S. Lane works remotely for the Center for Courage & Renewal to develop programs that deepen the leadership formation of people of faith and support healthy congregational life. She lives in Durham, North Carolina, with her husband Rush, where she is a board member of the Resource Center for Women and Ministry in the South and she belongs to a United Methodist church. You can follow her on Twitter and check out her website for more information. You can purchase Lessons in Belonging from a Church Going Commitment Phobe here. If you’d like to read the first two chapters of my new book, Beginnings, please click here. I’d love to hear what you think! This chapter was one of the hardest and most beautiful of the whole book, if I’m allowed to say that. I wrote about God, in whose image we are fashioned. I wrote about the God that is fully masculine and fully feminine. I wrote about the God who is not a man; but who is not genderless either. I wrote about the God who is genderful. I came to this understanding of God over time, like ants slowly building a hill. I painstakingly carried little pieces of experience and study and imagination until I made a home, one that feels expansive and full, the kind of home in which God would have plenty of room to stretch out and be comfortable. I hope you read about it in the book, which – you guys! – comes out in just over a week. I’m so excited and nervous and giddy, and I’m so grateful for you all. You’ve encouraged me, you’ve pushed me up the hill, and we’re almost ready to send it out into the world. But I’d like you to read something else today about God’s image, something generative and beautiful from one of my new friends. Erin S. Lane is a thirty-something writer and facilitator who, in her own words, “schemes ideas for better belonging.” In addition to working for The Center for Courage and Renewal, she has written an absolutely stunning book called Lessons in Belonging From a Church Going Commitment Phobe. Seriously, I’m having a very difficult time putting this book down. It reads like a letter from your best friend, telling you secrets about what really matters when it comes to God, church, and your own agency within all of it. Erin did her masters thesis on God’s genderfulness at Duke University, and she also wrote an excellent article for Q Ideas, which I’d like to repost here (with her permission). She’ll also be my guest this week on the podcast, so make sure to check that out. Enjoy! Give me one moment while I have a conniption fit,” I cautioned Rush. We had been fine a few minutes earlier, talking about a worship service he was planning for his youth group. Our friend Will, who would be leading music with him, had just spent an hour picking and strumming and singing in our living room. I apologized to Rush for being a hermit and not coming out of the bedroom to say hello, but there was no bad blood between us. Not until he mentioned a particular song he was planning to sing. Sunday worship is the hardest hour of my week. And it’s not because I’m an introvert who often sits alone. Nor is it because I have trouble hearing God in a service that relies so heavily on words, words, and more words. Sunday worship is the hardest hour of my week because it’s the one in which I show up begging to get a glimpse of God’s abundance and leave feeling a little less human. It’s the one where I worship a God who is always a he. “You’re singing the jealous song?” I asked, actively working on my tone. Rush tells me my tone is often off-the-charts awful. I tell him maybe he’s tone deaf. Either way, I wanted to play nice with my partner. By now Rush could tell something was festering because I was trying too hard and trying too hard was the telltale sign. Something did not fit. Read the rest of Erin’s post here. A big congratulations to Kristy Berksza from Norwood, Massachusetts, who won last week’s copy of Beginnings. I’m giving away one copy of Beginnings per week between now and release. I will sign it and mail it, totally free. All you have to do is email me, or send me a picture, of WHY you need a copy of Beginnings NOW. It could be hilarious, poignant, deep, shallow, whatever. It just has to be to me by Monday, December 28th. Email me at Steve (at) stevewiens.com or post it on Instagram, Facebook, Twitter, tagging me so that I can see it, and using the hashtag #BeginningsBook. I will pick one winner per week, based on my own completely random judgment of which one is best. Ready, go! This is the seventh post of an eight week series leading up to the launch of my first book, Beginnings. I’ll also be talking about it on my podcast, so make sure to tune in there, too!